Product code: ES6010 Categories: Sold Items, Sold Jewellery. Prince Albert chains or Albert chains and fob watch chains as they are also known as, were originally used to hold a gentleman’s pocket watch in their pocket on one side, the key on the other, and have the tee bar attached through the button hole in the at the waist similar to a cufflink. Incredibly popular in the Victorian time of the later part of the 1800’s, when in the early 1900’s men started to wear wrist watches, these Albert chains were then put down for many years until woman then picked them up and started wearing them around their neck as is most popular today. And here we have a lovely genuine antique Albert chain that is all original and dates from the late Victorian period. 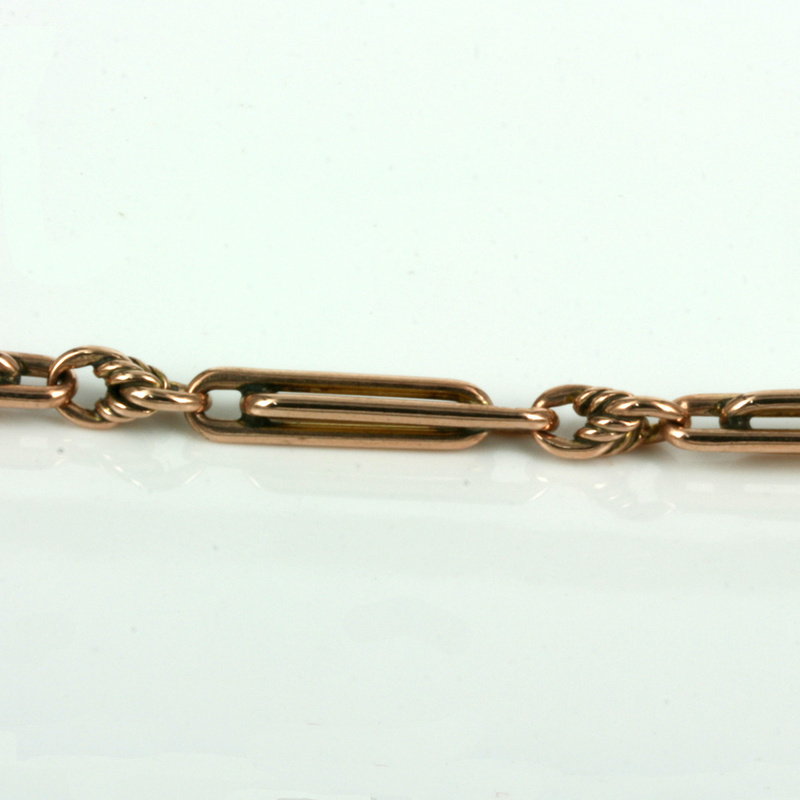 Made in Birmingham in 1898, this antique Albert chain is still in fantastic condition and was made in 9ct rose gold. The colour of the rose gold is so lovely and attractive and really has an elegant soft patina to it that can only be achieved after many years. With an incredible design to it, from end to end it measures 41.5cm and is fitted with two swivels at each end. So many of these around are either too short, or have had extensions added to it, so it is wonderful to get one that is not only in fantastic condition but also so easily able to be worn all the time. A very elegant and wonderful example of an antique Albert chain from the Victorian times.